As we all know, FCC is pushing hard on captioning rules. This should be great news for us – but there is a fear. rugby teams in Scotland. They play in a top rugby league. videos to learn how to improve themselves in action. disk jockey for local events. She does not use ASL. 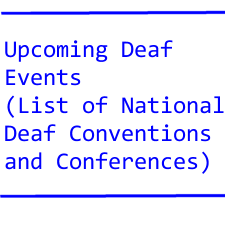 deaf in the state of Illinois. traveling for the first time with their new CI’s. real-time captioner to work with deaf students. of the Deaf and Hard-of-Hearing culture. Why? has negative thoughts about the deaf. public transportation. Condos? The ADA does not cover it! more of an a case by case basis! play in a major league game. Will he play in the majors?